Our family, the bunch of Parcheesi-heads we are, hosted our second annual Parcheesi Tournament this past January in honor of my late grandmother, Carlota, aka Mamita. (See this post with my tribute to Mamita and her love of Parcheesi.) It was a blast, filled with laughter, yelling, neck wringing, and tons of food. It was also great to see the tournament expand from the previous year with four additional players, some of whom were quite new to the game but still played remarkably well. 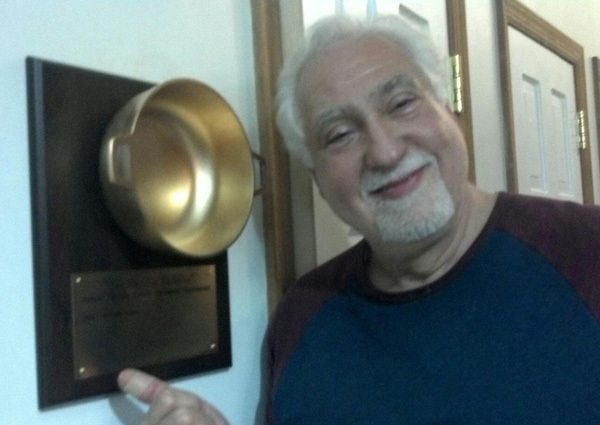 Last year’s winner, Willie, pointing to his name on The Golden Caldero. 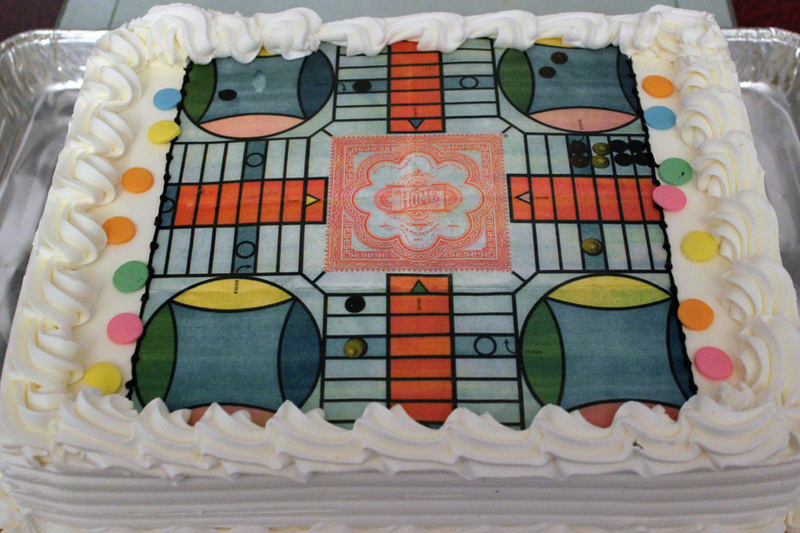 Yes, it’s a Parcheesi cake. I told ya, we’re freaks. After the preliminary qualifying games, we were down to our four finalists: my brothers-in-law Pete and Jim (left and right respectively), my father Frank (center), and my cousin’s daughters Kristina and Lauren (who played as a team throughout the day, though they each proved worthy of playing for themselves next year). The end of the last game was a serious nail-biter. Everyone had their first three men home already, and all but one player had their fourth and final piece in the home stretch, just needing that one perfect roll of the dice to win the game. Turn after turn, ’round and ’round the table, with no one getting that desperately needed die. My father finally rolled the two he needed and won the tournament. Congratulations Dad! Your name shall take its eternal place upon the plaque of The Golden Caldero (and now we all know exactly who to plot against next year. ;)). 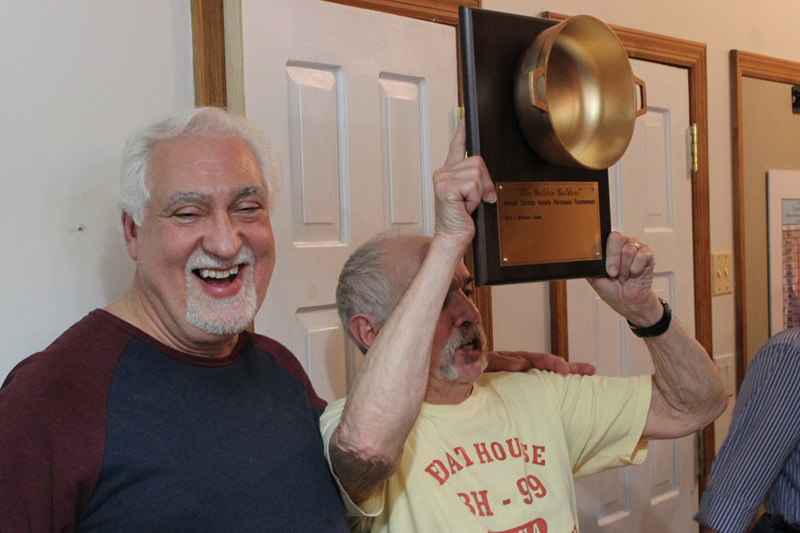 Willie passing The Golden Caldero on to this year’s tournament winner, Frank. Wow I love how official and serious your family is. Such a special and fun tradition you have. Tell me about the tournament food! Is eating during play forbidden of encouraged? For lunch: sushi, sandwiches, deli salads (potato, macaroni, couscous), pastelillos (also known as empanadas, basically a fried meat pie), turrones (a Spanish almond-nougat candy), guava paste with cheese and crackers (sounds gross but it’s delectable), a cheese and cracker plate separate from the one with the guava, and various chips & dips and whatnot. For dinner: rice and beans, baked ziti, chicken marsala, sausage & peppers. We brought in and/or pre-made nearly all of the food, since we were trying to limit the amount of day-of cooking. Anyone there who would have been cooking was playing in the tournament, and we didn’t want any game delays waiting for someone to finish a cooking step. We also nixed the idea of wings as we were afraid someone might forget to wash their hands before putting their hands all over a board. It was even better this year…loud, raucous and FUN!! This year really was a blast. I can’t wait for next year! How can I order the 6 player parcheesi board game?